From the award-winning translators of Anna Karenina and The Brothers Karamazov comes this magnificent new translation of Tolstoy's masterwork. 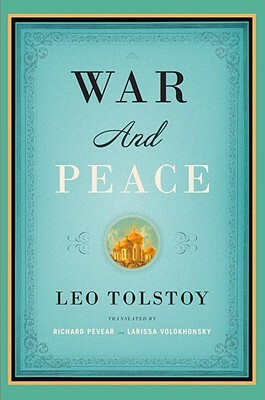 War and Peace broadly focuses on Napoleon’s invasion of Russia in 1812 and follows three of the most well-known characters in literature: Pierre Bezukhov, the illegitimate son of a count who is fighting for his inheritance and yearning for spiritual fulfillment; Prince Andrei Bolkonsky, who leaves his family behind to fight in the war against Napoleon; and Natasha Rostov, the beautiful young daughter of a nobleman who intrigues both men. A s Napoleon’s army invades, Tolstoy brilliantly follows characters from diverse backgrounds—peasants and nobility, civilians and soldiers—as they struggle with the problems unique to their era, their history, and their culture. And as the novel progresses, these characters transcend their specificity, becoming some of the most moving—and human—figures in world literature. Count Leo Tolstoy (1828-1910) was born in central Russia. After serving in the Crimean War, he retired to his estate and devoted himself to writing, farming, and raising his large family. His novels and outspoken social polemics brought him world fame. Richard Pevear has published translations of Alain, Yves Bonnefoy, Alberto Savinio, Pavel Florensky, and Henri Volohonsky, as well as two books of poetry. He has received fellowships or grants for translation from the National Endowment for the Arts, the Ingram Merrill Foundation, the Guggenheim Foundation, the National Endowment for the Humanities, and the French Ministry of Culture. Larissa Volokhonsky was born in Leningrad. She has translated works by the prominent Orthodox theologians Alexander Schmemann and John Meyendorff into Russian. Together, Pevear and Volokhonsky have translated Dead Souls and The Collected Stories by Nikolai Gogol, The Complete Short Novels of Chekhov, and The Brothers Karamazov, Crime and Punishment, Notes from Underground, Demons, The Idiot, and The Adolescent by Fyodor Dostoevsky. They were twice awarded the PEN Book-of-the-Month Club Translation Prize (for their version of Dostoevsky's The Brothers Karamazov and for Tolstoy's Anna Karenina), and their translation of Dostoevsky's Demons was one of three nominees for the same prize. They are married and live in France. "Tolstoy's War and Peace has often been put in a league with Homer's epic poems; it seems to me that the same might be said for Pevear and Volokhonsky's translation of his great novel. . . . Their efforts convey a much closer equivalent in English to the experience of reading the original."